In Jaunary of 2011, Tom had the honor of being interviewed by Serge Panchenko for a series of Knifemaker Interviews on bladesmithsforum, to top knifemaking forum on the Web. Can you tell us about yourself, how you got into knifemaking and where your inspiration comes from? Can you tell us about yourself and how you got into knifemaking? I’m 58 years old, and rapidly getting older… I’m an Air Force brat, and grew up in Texas, Mississippi, South Carolina, England (several times), France, and Florida. I think of Florida as my first home, since that’s where I spent the longest. I now live in Coupeville, Washington, about 50 miles northwest of Seattle, on the largest island in the continental US, and with surprisingly good weather. 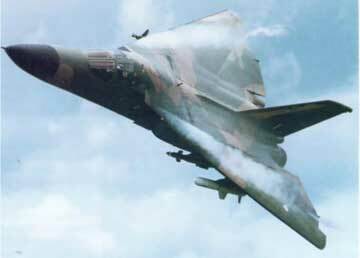 I’m retired from the US Air Force, where for the most part I flew F-111 fighter-bombers of various flavors, also known as Aardvarks or “McNamara’s Switchblade Edsel” of Vietnam fame, for those of you old enough to remember such things. It was this particular activity that got me started on the path of knifemaking, although I couldn’t have predicted it at the time. 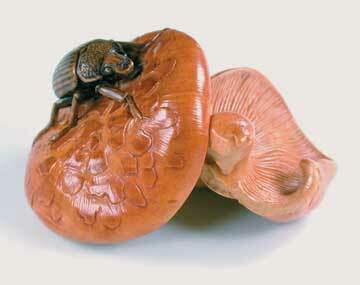 It was the Air Force that took me to California and the DeYoung Museum of Art in San Francisco where I discovered the ancient art of Japanese Netsuke, very high quality small scale sculpture. Years later, trying to find an escape from the pressures of F-111 low level flying through the mountains at night and in crappy weather, with nothing between me and instant/certain death but a thin radar beam built by the lowest bidder, I began carving netsuke for fun. 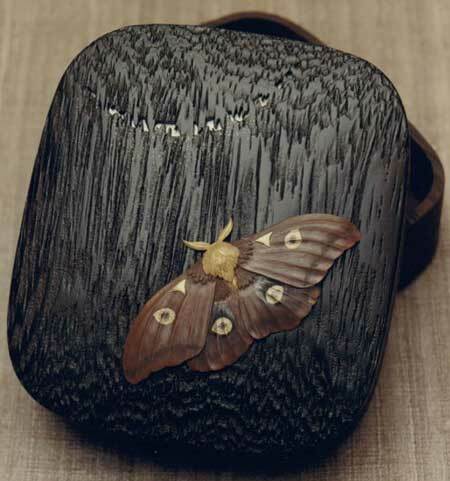 After retiring from the Air Force I carved netsuke professionally until September 11th killed the contemporary netsuke art market. At that point, I began looking around for the next big thing. I noticed that some of the folks associated with the Japanese art market occasionally made knives, and started thinking in that direction. Jim Kelso, Ford Hallam, Guy Shaw, to name a few. At the same time, I ran into a friend on the island here who was into flint knapping, Dr Joe Higgins, and I learned to make stone blades. 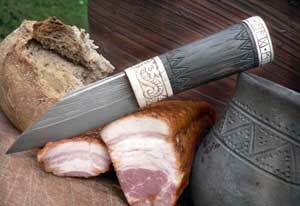 We began collaborating on stone knives, where Doc made the blades, and I decorated the handles. I found Bladegallery.com (physically located near Seattle), got a lot of very good advice from Daniel O’Malley, the owner of Bladegallery, and was off and running. From stone knives, it was only a short hop to begin thinking about steel blades. About that time, Don Fogg posted a simplified method of making small steel carving tools on The Carving Path Forum, and it was simple enough that I began understanding how to take the mystery out of steel. 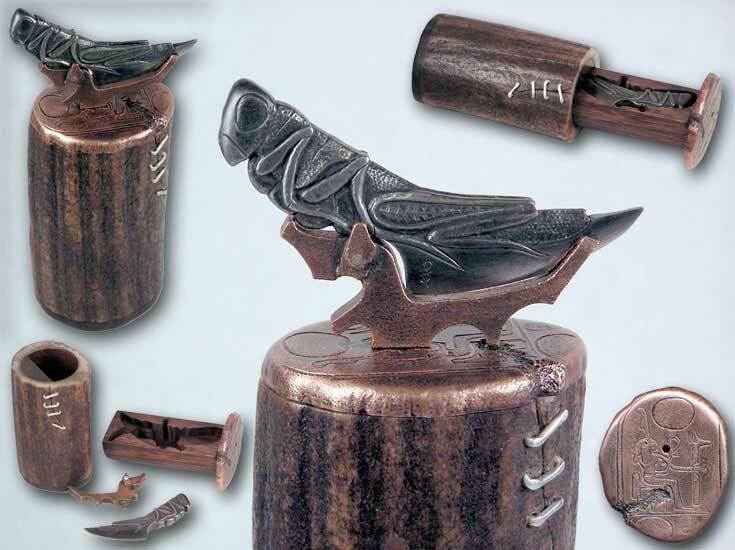 As it turned out, my experiences carving netsuke were directly transferable to metal, just with smaller bites out of the material. I’ve recently been working to add engraving to my metal sculpting skills. 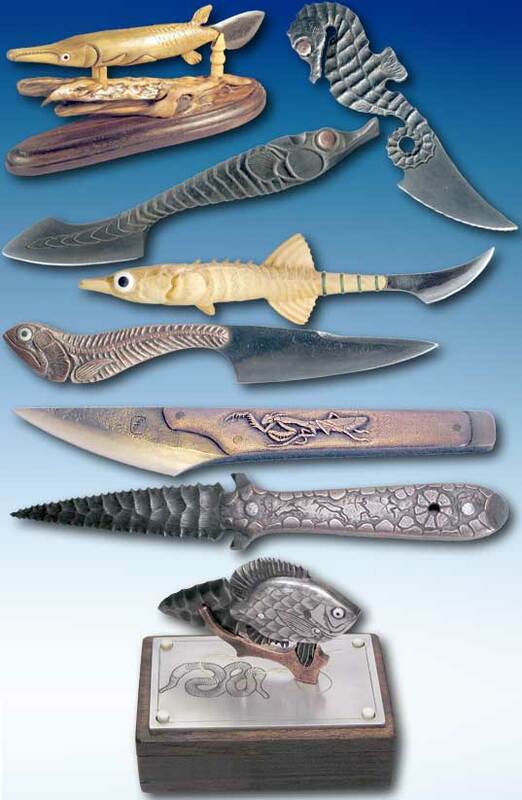 Below is a short retrospective of some of my steel knife evolution, roughly in order timewise, from top to bottom. My Mom passed away recently, and as I was talking to my Dad during her memorial, something he said struck me in one of those epiphany moments. He mentioned that at every point in their lives when things were uncertain, something happened that caused them to take a change of direction. As he looked back at their sandy footprints on the beach of life, so to speak, he could see where they were guided in the direction they needed to go, even if they weren’t so pleased at the time (he was a POW for six years during Vietnam). I have to say that I can see the same things in my life, and the rather tortuous path that has led me here. It’s going to be very interesting to see what happens next! Can you tell us where your inspiration comes from? Tough question! Inspiration – that’s the hardest part of all. Pretty much everything else is a skill, and skills can be learned by anyone with sufficient commitment. Inspiration, on the other hand, is a spur of the moment thing, a spark. When it comes to my work, I prefer to think of inspiration in a more concrete sense – it’s more than that momentary spark, and includes a practical aspect where the idea is actually something that can be accomplished within my skill set. I’ve noticed that a successful knife design must obey the laws of physics, but the things that go on in my head do not, so I define “inspiration” as an idea along with a do-able design. I find inspiration in lots of places, but mostly in what I see on the internet. 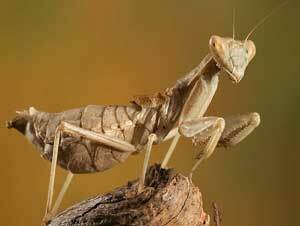 Often it’s the shape of a particular blade or handle, or a photograph of an animal. I probably spend several hours a day surfing all kinds of art and craft related sites looking for that elusive inspiration. A lot my ideas seem to come at O’dark thirty in the morning when I wake up and think, “Eureka!” Then hope I can remember it the next day. Probably some of the greatest of human thoughts have been thought and promptly forgotten by me! Then comes the hard part, creating a composition where the critter on the handle and the blade all work together as a total harmony. To drop just a few names, I never miss the posts of Alan Longmire, J Arthur Loose, Jim Kelso, Jake Cleland, that Serge guy, the Mad Dwarves, Tai Goo, Jake Powning, Raymond Richard, Petr Florianek, and of course, Don Fogg. 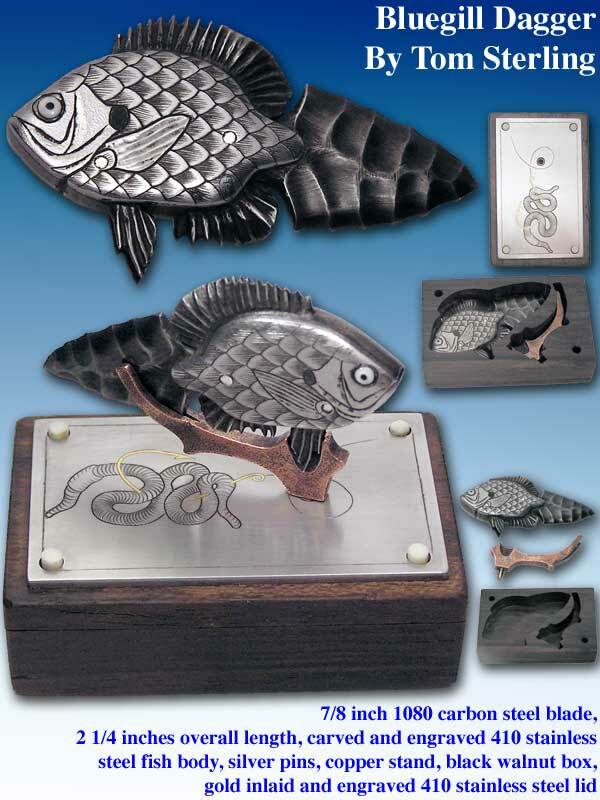 I also watch Ford Hallam (Japanese style metalwork) and his brother, Clive Hallam (netsuke), Sue Wraight (netsuke), Janel Jacobson (netsuke) closely. Lately, since I’ve taken up engraving, I watch what happens in that world as well, Steve Lindsay, Sam Alfano, Ray Cover (I took a remarkable class from him this summer), and lots of others. Jacques Delfosse: Dear Mister Sterling, I’m very happy and interested to read your interview, so as I was for Serge and Petr…and more! You are a great artist with understanding of live and craft, so as are Petr and Serge. I have seen that you showed a knife of Petr : I would say I’m the proud and lucky owner of this knife, I bought in Prague, from Petr. The name is Fliccebana. Petr made also Merowingian Sax for me, for my 65th. birthday. I admire peoples as you all and can only say that it’ s always a very great pleasure to read and appreciate this thread! 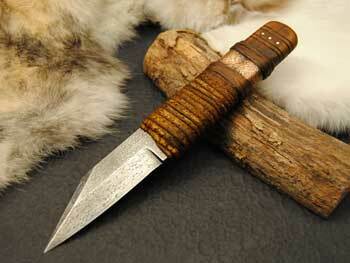 You are very inspirating for me, as a simple hobbyst knife and sheath maker. Thanks for the kind words. Petr’s little knife is one of my favorites, and speaks to me on many levels. I keep a picture of it nearby, and intend to make one like it for myself one day – although, I suppose knifemakers are like the shoemakers kids, who always go barefoot! Both Petr and Serge are makers who I regularly get a good bit of inspiration from. Allthough I’m not a big fan of saxes, Petr’s work is always attractive, and I love the combinations of materials he uses, and his carving really enhances the overall feel of the piece. Serge’s work also uses interesting and attractive combinations, and his innovative shapes are always attractive and well thought out. Both have developed what one could say is their own “style.” I have no doubt that in the future we’re going to see knives made by other makers in “Serge style” and “Petr style,” much as we see “Scagel style” or “Loveless style” today. Well, let’s see – this was one of those cases I mentioned before where several events occurred and everything came together. 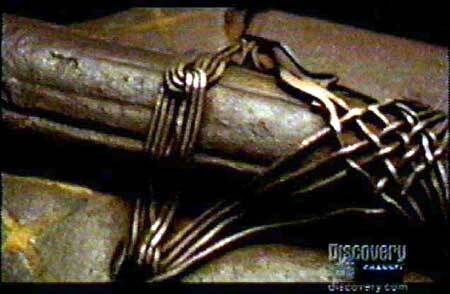 It started with a PBS program about the Longinus Lance, or Spear of Destiny. This thing was just so cool in its’ construction that I had one of those “eureka” moments. Unfortunately, it was well beyond my capability to construct something like it (and probably still is). 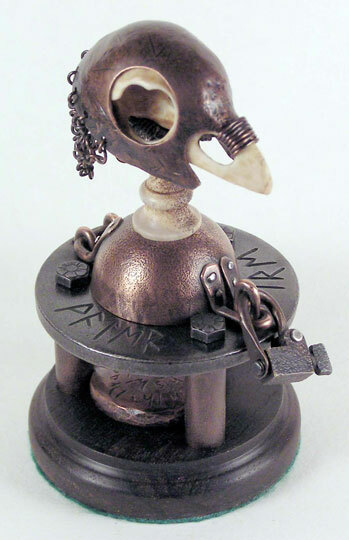 At the same time I was also interested in medieval reliquaries (highly decorated and precious religious containers for saints bones and relics) and was exploring them on the internet. 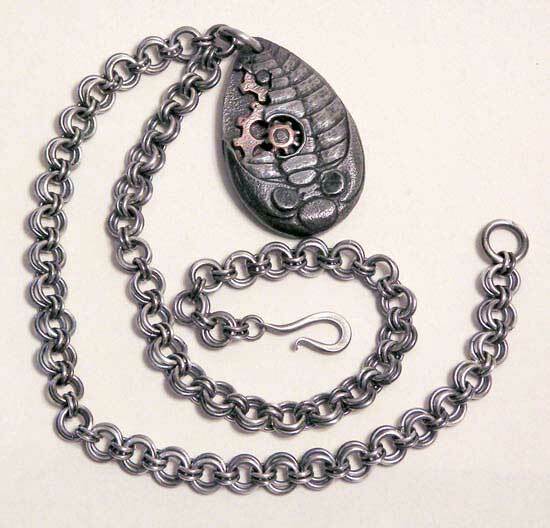 As if the planets aligned, I stumbled across a jewelry artist, Richard Salley, who was making really cool pendants out of junk objects and constructed elements from common hardware, and he had a short tutorial on the techniques on his web site. So, suddenly, I had the interest, the inspiration, and a bit of guidance on the “how.” So things just got sort of mixed up in my head, a bit of fantasy was added (Lord of the Rings was still going on! ), I was reminded of a netsuke Sue Wraight had carved in the mid 1980s of a basilisk, which is a rooster/snake combination born from a rooster’s egg, and this weird little thing came together. Add in some Viking runes for earth, air, water, fire, and a quote from King Lear, and there you have the entire story. Another month of sketches and a hell of a lot of thought, some practice engraving (did I mention I was beginning to engrave about this time, and had been carving some bird skulls in antler that proved to be economically popular? ), a month of carving, construction and the occasional false start, a span of twenty-plus years of wool gathering thoughts and experience, and, voila! Did I mention before that the inspiration/planning is the hardest part? 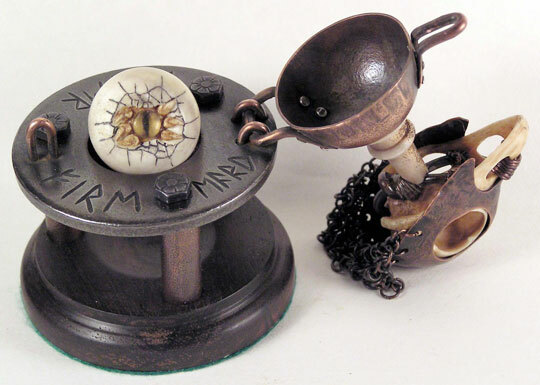 It’s made from a large steel washer, lots of copper, silver rivets, amber (the basilisk eye, a netsuke carving technique), and moose antler. 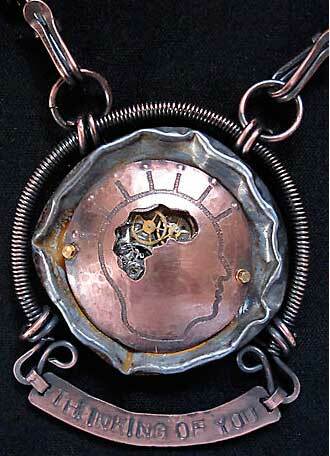 This was one of the things that really showed me how dark steel and antiqued copper really complimented each other. 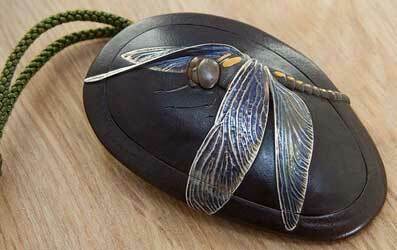 You may have noticed how most of what I make is designed to look old and worn (kind of like me! ), and often contain fake repairs. How long do you spend on your knife projects, do you work a little at a time or spend a whole day working non-stop? What are your plans for the future? Any particular skill you are trying to develop? Tom Sterling: That’s the question I get the most – how long does it take? A typical art knife takes about a week of physical work (as in 6-7 eight hour days), not including thinking about it and designing on paper/computer. Thinking/planning may take weeks or even months to complete. I’m seldom able to spend all of that time in one sequence, and a typical day for me is about four hours of physical work, and the remainder of the day filled with planning-type tasks. Of course, as we all know, there are vinegar soaks, epoxy curing, tempering, etc. that interrupt the flow. Ideally, I like to have several projects going at once. I find if I have to work on just one, that sometimes it feels a bit stale, and I like to be able to switch off to another piece when that happens. Then again, there is the occasional bit of art that just catches fire and I work almost non-stop at it. Those are the ones that I live for! I’m currently trying to learn to engrave, and attended a really excellent course this summer with Ray Cover, one of the top engravers in the US. That really helped me get over a hump in learning to engrave, and now there’s lots of practice to help me improve. 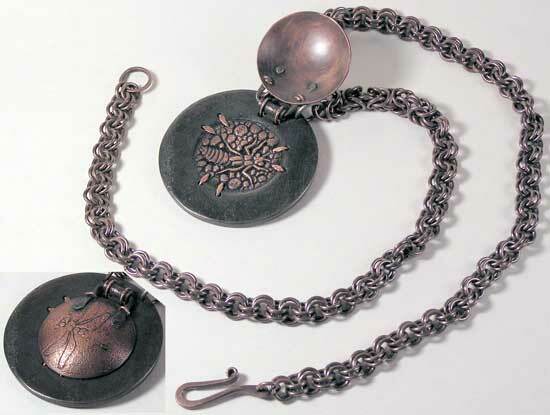 Japanese art has been a large influence on my work, and I’m also investigating Japanese-style metalwork methods. In that vein, I’ll announce here that our next interview victim will be Ford Hallam, and we’ll explore the avenue of his approach to Japanese art metalworking! Here’s a knife I just completed using the skills I learned from Ray, including my first gold inlay. An awful lot of engraving for a little two inch knife! Serge Panchenko: Awesome Bluegill Tom!!! Amazing detail on this one. Thanks so much for all the answers, I have a much better idea of how your art pieces come to be and your process. If any one else has any questions please post. Tom, thank you!! richard sexstone: Tom – you have told us a little about making and designing your work .. can you tell us some about how and where you have sold it . what was the easiest sell ?and what took the longest..
Do you work with a customer in mind or just make what you like and then worry about who gets it?Little bit of both? which do you prefer? I have really enjoyed you interview…. Can you tell us some about how and where you have sold your knives. what was the easiest sell? and what took the longest.. Currently, almost all of my work is sold through www.bladegallery.com, mostly through their web site, with a few sales through their attractive physical gallery in Kirkland, WA (the Epicurean Edge) to walk-in customers. A few inexpensive items also go through a small cooperative gallery in Coupeville WA, where I live. Some of my work seems to get snapped up in a few hours to a few days. I keep records of when an item goes up on the website and when it sells, and periodically analyze the results to keep my sales practices sane. Generally I find the easiest things to sell are knives that have a unique and striking look to them, that stand out from the other more “normal” looking knives. 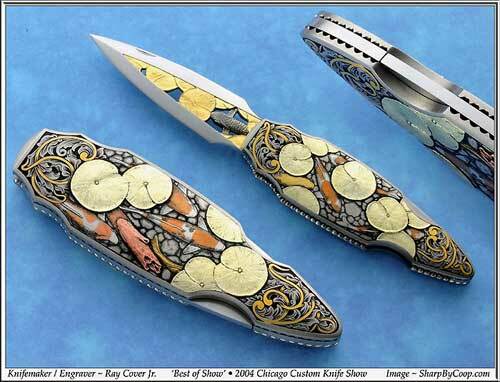 It really helps to have a knife that catches the viewer’s eye in some way, either in shape or color. When you think about it, a prospective client surfing through a lot of knives shown in small thumbnail images has a difficult task, and if you can catch his eye quickly, you’re ahead of the game. Of course, to state the obvious, price plays a very large role. I depend a lot on the guys and gals at bladegallery.com to keep me grounded on price. I’d like to be able to charge an hourly rate for a knife, where pricing would simply result from multiplying the number of hours of work times the shop rate and add in materials, but that seldom works. 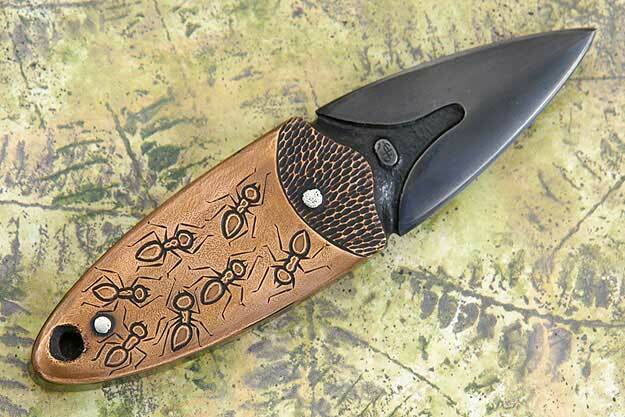 Here’s one that just left bladegallery.com almost immediately, the Carpenter Ants Dagger. It has an unusual shape, eye-catching color contrasts, and shows up well in a small thumbnail image. Did I mention the bladegallery folks also do incredible knife photography? Also, there are communities within the edged weapon world that have rules or expectations that you must meet to be successful. Two that come to mind are the Japanese-style (Nihonto) and primitive or reenactor world. As an example, I made a small kiridashi-style knife with engraved copper scales, but rather than a single beveled edge, I “Americanized” it with a standard western-style grind with centered edge. 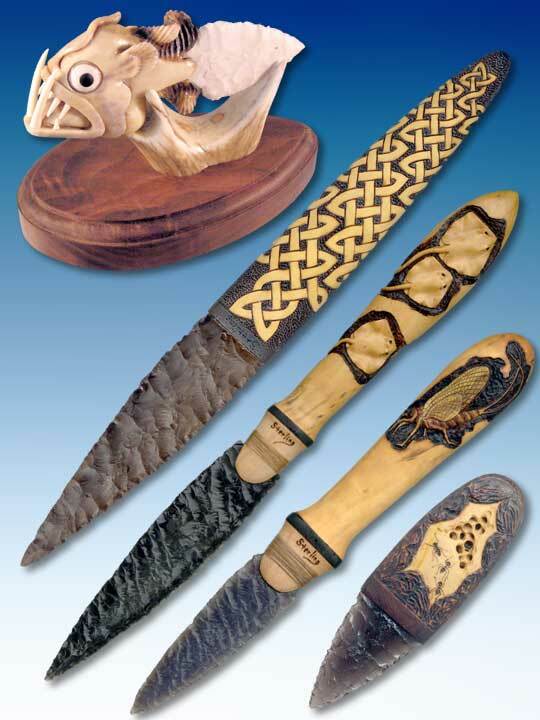 As a former wood carver, I’ve never liked the Japanese-style single beveled edge since it takes a left-hand and right-hand version of a blade shape to actually carve a piece of wood, ivory or antler. I took a bit of criticism for the double bevel since it wasn’t what Japanese-style knife collectors expected. The customer is always right! Tom Sterling: I seldom take commissions. Once in a great while I take one that seems to be a good idea, but invariably I begin to remember why I seldom take commissions. I find if I’m doing a commission, the work actually becomes work. I don’t feel like I’m in charge with a commission; I’m guessing that’s because I’m not! I enjoy making knives the most when I’m working on something that I want to work on. It’s also much easier to give my best efforts when I’m working on something for me.